First off, I apologize to those of you who do not know what I’m talking about. Considering my audience consists of five people, none of whom are even my mom, the topic I’m covering is not a normal area I cover. 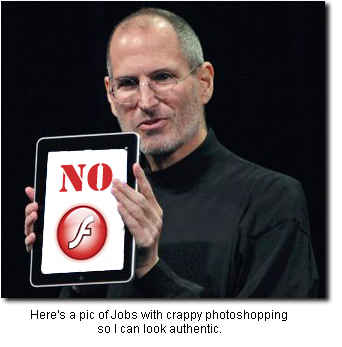 Steve Jobs released a statement on his Thoughts on Flash. He is basically stating reasons why Apple products will no longer support this technology in the future. The blogsphere responded with wailing and gnashing of teeth. I liked Charle’s Stross blog post which got to the top of reddit. Wait, you ask. What is Flash? Back in the day, there was this push to have everything cross-platform. Cross-platform meant that you could have one program work on more than one type of machine. If you want your favoured game of Bejeweled, you could play it on a PC, on a Mac, maybe even your Gameboy! So the powers that be came up with something called Java. A programmer could write up the code and after only a mere few hours of frustrating work, he or she could get the thing to work sluggishly on all computers… give or take some features. Now I have to admit, I don’t know much about Java. I’ve heard things have gotten a lot better. Also, I’m not an expert in the field of programming so I don’t qualify for any potshots at any language. But man was it slow. Furthermore, they teach it in schools. How useful can it be if school is teaching it? Anyway, we’re not here to listen to my uneducated rants about Java. Thing is, there was this other cross platform engine that allowed you do all sorts of things and it looked cool as well. This was flash. And as soon as flash took off, so did the number of crappy flash animation done by 12 year olds. Mine weren’t any better. In the below example, you can’t even stop it once it gets started, so I warn you now! And now there are whole sites made in Flash, much to the chagrin of many developers. But you know Webkinz? Disney Princess? Kongregate? 90% of every browser based game out there? That’s all Flash. (I made that stat up, btw, but there’s a lot). 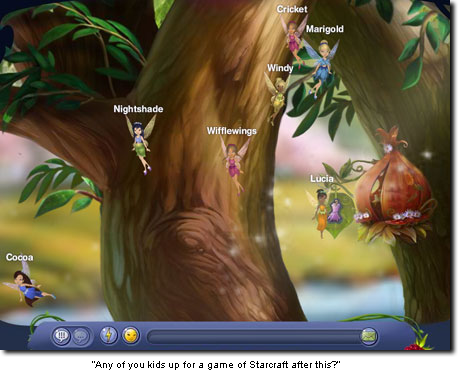 Immediately, I threw Ekko out of her chair and started to see how I could interact with the other fairies. To my dismay, I couldn’t type anything. I had all these wonderful plans to mess with their minds but all I could do was say things like, “Beautiful day in Fairy land!” or whatever tripe I was restricted to. Dejected, I handed the keyboard back to Ekko and went about my business. Anyway, Flash is everywhere. And Steve Jobs wants to kill it. Sure he gave all these reasons, and these reasons were good reasons. But seriously, the main reason is he can’t control it to make even more money off of it. One of his points was battery life. Uh… What? Do any of you remember those early ipods where you had to send the suckers in to get the battery replaced? Suuuuure you’re concerned about battery life. Remember that rant about Java? Well, Flash is cross platform. Well, for the most part. Linux didn’t get Flash until… uh… when? Last year? But it was pretty darn good for being both on a Mac and PC. Jobs doesn’t want that. He doesn’t want it cross-platform. As is mentioned in one of those articles, it’s all about the Al-ighty App store. Heck, I can’t blame him. He’s a business man. He wants to own the computer world. Which company doesn’t? Why am I talking about this? Well, the thing is, I am considering making a game and I am debating what to program in. Look, I’m no huge lover of Adobe either. Flash has caused me so much grief over the years, but at the same time, it’s worked. They talk about how HTML5 will replace it. I found this really cool sight called Akihabara and it’s amazing because you can do it all in HTML5! But you know what else is amazing? Sound. That’s right, sound. And I need sound for the game. This reminds me back to an old interview with Douglas Adams right after he made his games with Infocom. It was in an issue of Electronic Games, or Computer Gaming World (I can’t remember which, and you’d think I could find this on the internets, but nooooo) and he was saying the next big thing in gaming wasn’t graphics, but sound. We tend to forget how important sound is until it’s not there. 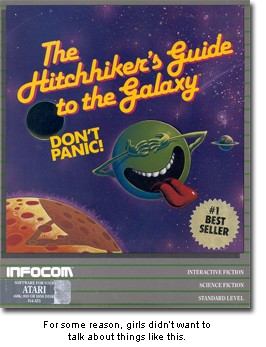 By the way, if you wish to play Hitchhikers Guide To the Galaxy, the original text game, except with snazzy graphics, you can do so at the BBC Radio 4’s browser implementation. I spent many nights playing that game. Without the graphics… nor the fast loading times. So after much thought and consideration, if I do get around to writing this game, it will be in flash. If, in five years, the whole internet has changed, I do believe that the front end can be reworked because the user data in the back will be saved, and that’s what will be important. But I want to deliver an attractive, smooth and reliable *cough* front end, and I don’t know if I can accomplish that with HTML5. And I need sound. Not that Jobs cares, but I’m ignoring his grim prediction and I am sad that what I make will not be on an ipad. I want one of those things, I really do. 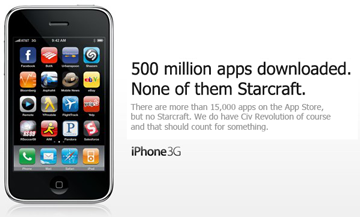 But who’s going to have time once Starcraft 2 comes out? Not me. And Civ 5? Good grief, it’s like I should book marriage counseling now.